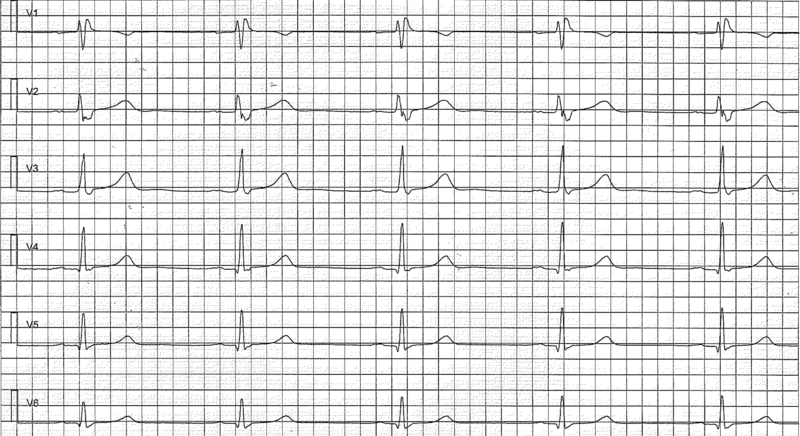 Although the early repolarization pattern has been recognized for almost 50 years, it is still one of the most frequently confused ECG findings. This is largely due to the fact that a universal definition of early repolarization is still lacking. Consequently, ECG criteria for early repolarization has varied over the years and across studies. This has lead to much confusion. In 2015 MacFarlane et al issued a consensus statement (refer to MacFarlane et al) and in 2016 Patton et al did likewise (refer to Patton et al). Surprisingly, the definition of early repolarization differs slightly in these two papers and the authors of this article decided to adopt the criteria from MacFarlane et al. However, the confusion actually extends beyond the ECG definition. For decades it was believed that early repolarization was a benign condition, which is why the term benign early repolarization was coined. This notion was overturned in 2008 when Haïssaguerre et al reported a strong association between the early repolarization pattern and sudden cardiac arrest due to idiopathic ventricular fibrillation. The combination of early repolarization pattern on ECG and ventricular fibrillation or sudden cardiac arrest is referred to as early repolarization syndrome. The term “early repolarization” was used to describe the ECG pattern. Indeed, the ECG gives the impression that repolarization starts earlier than normal in these patients. However, it is still unknown whether that is actually the case; i.e repolarization may actually not start earlier than normal, despite the ECG appearance. The absence of a consensus definition of early repolarization has lead to variability in prevalence figures. Overall, prevalence estimates between 1% and 18% have been reported. In the consensus report by MacFarlane et al it was noted that roughly 5% to 13% of all individuals in a Western population displays early repolarization pattern. It is more frequent among men, young individuals and blacks. In a seminal paper published in 2008 by Haïssaguerre et al it was reported that early repolarization was associated with 3–5 times as great a risk of idiopathic ventricular fibrillation and sudden cardiac arrest. This is a rather large increase in relative risk, but the absolute risk is still very low among most patients with early repolarization. Readers not familiar with the terms absolute and relative risk may be confused by the previous paragraph. The absolute risk of an event (such as sudden cardiac arrest) is simply the number of individuals that experience the event divided by the number of individuals at risk. For example, if 3 individuals experience cardiac arrest in a population of 100 individuals, the absolute risk would be 3%. If 2 of those individuals where males and 1 was a female, then males would have two times as great a risk. Although two times the risk may seem very much, it only amounts to one extra case. So, even if the relative risk is high, the absolute risk can be low. The biological mechanisms underlying the early repolarization pattern and the risk of ventricular fibrillation remains elusive. This is a rather complex topic which is only of relevance to researchers in electrophysiology and arrhythmology. Regarding the risk of ventricular fibrillation, it is believed that early repolarization is caused by altered ion channel function (alterations in sodium, potassium and calcium currents have been suggested). The altered ion channel function leads to regional dispersion in the refractoryness. This means that some myocardial regions will be refractory while others will be excitable at the same time. As previously discussed (refer to Reentry and arrhythmia mechanisms, as well as Mechanisms of atrial fibrillation) whenever there is varying excitability (conduction) in the myocardium, there is a risk fo re-entry occurring. Multiple re-entry circuits in the ventricles may cause ventricular fibrillation. Regarding the ECG hallmarks of early repolarization (ST segment elevation, notched or slurred end of the QRS), it is believed that these ECG changes are caused by voltage gradients between myocardial regions. Refer to Patton et al for details and references. It is likely that the early repolarization pattern includes several subtypes, with varying heredity and risk of arrhythmia. The genetic basis of the condition proceed from the fact that early repolarization pattern, as well as syndrome, is more frequent among relatives of individuals with early repolarization, as compared with control persons. Mutations in KCNJ8, SCN5A, among other genes, have been reported in patients with early repolarization. Yet, Sinner et al performed a meta-analysis which failed to identify any gene variants associated with early repolarization (Sinner et al). It is conceivable that the findings by Sinner et al are somewhat misleading because of the varying definitions of early repolarization in the data source used in the analysis. Genetic testing can currently only be recommended in selected cases with presumed malignant form of early repolarization (i.e with very high risk of sudden cardiac arrest). Early repolarization is frequently confused with other common causes of ST segment elevation and J wave syndromes. Because early repolarization is common and studies suggest that it is associated with increased risk of sudden cardiac death, it is important that health care providers are able to recognize the ECG pattern. Failure to do so may lead to unnecessary referrals, examinations and interventions. 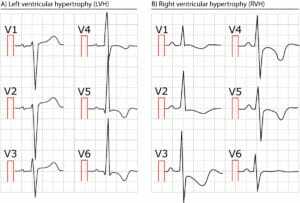 Early repolarization manifests in the inferolateral leads (II, III, aVF, aVL, I, –aVR, V4, V5, V6) and it appears that the risk of ventricular fibrillation is highest when ECG changes are evident in the inferior leads. ST segment elevations with concave ST segment. The ST elevations are most pronounced in the chest leads and they are accompanied by prominent T-waves. Virtually all patients with early repolarization display ST segment elevation. 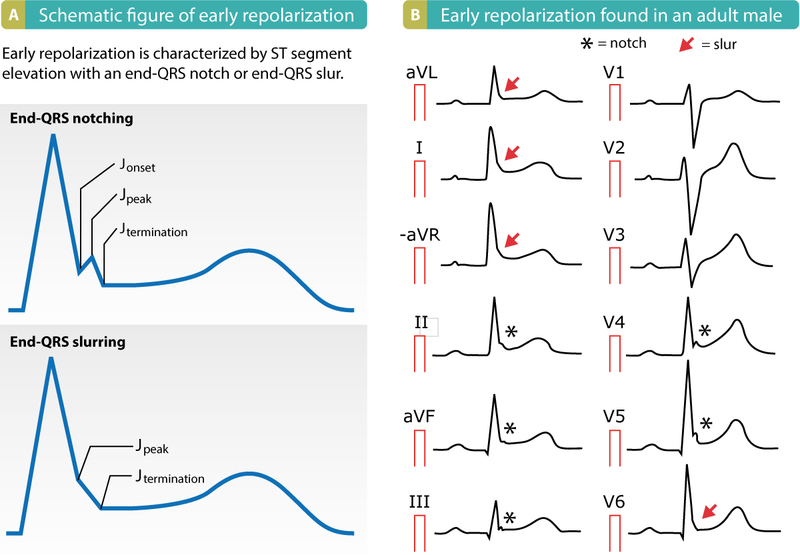 The hallmark of early repolarization is the end-QRS notch (a notch in the J point) or the end-QRS slur (the final slurring part of the R-wave). Refer to Figure 1. Figure 1. Early repolarization pattern on ECG. Note the end-QRS notches and slurs, as well as the ST segment elevations. The end-QRS notch is located above the baseline and the end-QRS slur starts before the baseline is reached. As seen in Figure 1, the terms Jonset, Jpeak, Jtermination are used to desbribe the notch/slurring. However, these terms lack clinical significance. In case of ST segment elevation, the magnitude of the ST segment elevation is always measured in Jtermination. 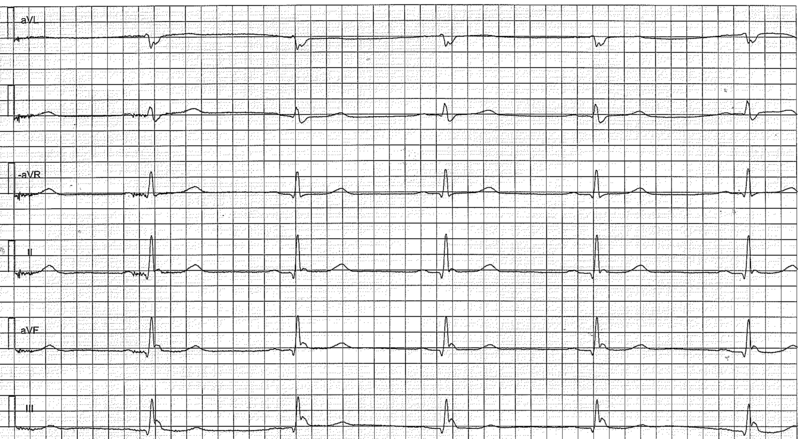 Notch or slur in transition between R-wave and ST segment. ST-segment is virtually almost evident. Jpeak ≥1 mm in at least two anatomically contiguous leads (V1–V3 are not considered). Figure 2. Chest (precordial) leads showing early repolarization pattern. This patients brother died from sudden cardiac arrest at the age of 29. Note the incomplete right bundle branch block (RBBB). Figure 2. Limb leads showing early repolarization pattern. This patients brother died from sudden cardiac arrest at the age of 29. The strongest risk factor of ventricular fibrillation is signs of early repolarization in leads II, III and aVF (i.e inferior limb leads). It also appears that the higher the J point the greater the risk of ventricular fibrillation. Some studies also suggest that the slope of the ST segment may be of relevance; a horizontal or downsloping ST segment has been associated with greater risk of ventricular fibrillation, as compared with upsloping ST segment. Early repolarization pattern on ECG does not require any treatment. Treatment with ICD (implantable cardioverter defibrillator) may be considered in patients who have experienced ventricular fibrillation or sudden cardiac arrest.